Moses Brother was named Aaron. Aaron was 3 years older than Moses. 7. And Moses was fourscore years old, and Aaron fourscore and three years old, when they spake unto Pharaoh. Aaron, the brother of Moses, married Elisheba and had 4 sons with her. Moses brother is first mentioned in the bible when God spoke to Moses at the burning bush. . God told Moses to go and speak to Pharoah, and Moses responded that he could not speak well. God then allowed Moses brother to be the spokes person. 1. And afterward Moses and Aaron went in, and told Pharaoh, Thus saith the LORD God of Israel, Let my people go, that they may hold a feast unto me in the wilderness. bring the children of Israel out of the land of Egypt. Even after they left Egypt and crossed the Red sea , Moses brother still spoke for him. 9. And Moses spake unto Aaron, Say unto all the congregation of the children of Israel, Come near before the LORD: for he hath heard your murmurings. 10. And it came to pass, as Aaron spake unto the whole congregation of the children of Israel, that they looked toward the wilderness, and, behold, the glory of the LORD appeared in the cloud. Aaron, the brother of Moses, collected the Manna that was placed in the Ark of the Covenant in the Holy of Holies, along with his rod that budded.
. Aaron and his sons were called by God to be high priests. 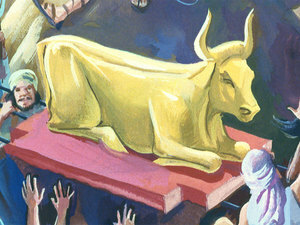 Moses brother was the one who made the golden calf while Moses was up on Mt Sinai communing with God. 5. And when Aaron saw it, he built an altar before it; and Aaron made proclamation, and said, To morrow is a feast to the LORD. Moses brother quickly put the blame on the people even though he as the High Priest did what they asked, instead of standing firm and leading correctly. 22. And Aaron said, Let not the anger of my lord wax hot: thou knowest the people, that they are set on mischief. 23. For they said unto me, Make us gods, which shall go before us: for as for this Moses, the man that brought us up out of the land of Egypt, we wot not what is become of him. 24. And I said unto them, Whosoever hath any gold, let them break it off. So they gave it me: then I cast it into the fire, and there came out this calf. However, when Moses asked the people who was on God's side, Aaron as a member of the tribe of Levi stood on the Lord's side. 26. 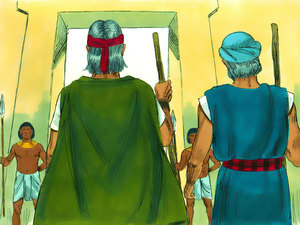 Then Moses stood in the gate of the camp, and said, Who is on the LORD's side? let him come unto me. And all the sons of Levi gathered themselves together unto him. Moses brother died on Mount Hor in the fortieth year after the Israelites left Egypt. Both Moses and Aaron did not go into the promise land after 40 years of wondering in the wilderness, because they did not follow God's instructions. Moses brother died when he was 123 years old. Click here and sign up to receive daily bible verses.